New $9.9 million town hall will replace crumbling former school that serves as town hall today. A decision by the Martha’s Vineyard Commission and a final site review by the planning board are the final hurdles to overcome before Oak Bluffs can begin construction of planned three-story town hall to replace the crumbling former school where town offices are now located. Town meeting voters earlier this year approved the $9.9 million project. The planning board and town selectmen have often clashed over the project, which has been on the drawing board since 2014. Earlier this summer the planning board referred project to the Martha’s Vineyard Commission for review. A public hearing was opened last week and closed the same night following public testimony. The written record remains open for public comments for another week. The commission’s land use planning committee will meet Tuesday, October 10 to review the project and likely make a recommendation to the full commission. A date for deliberations and a vote has not been set yet. A staff report raises a number of questions about the project, chief among them drainage since the new construction will increase the amount of paved or impervious surfaces. Other issues noted in the report are pedestrian and bicycle access, as well as the impact of construction and temporary staff housing on neighbors. 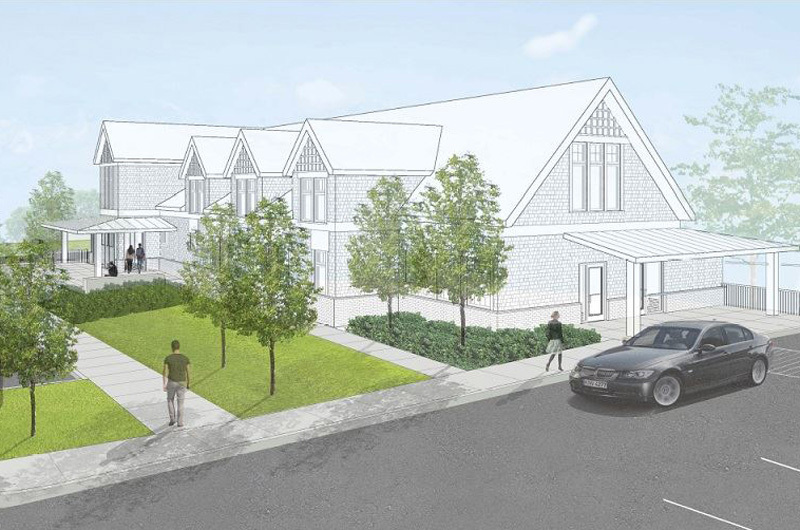 If the commission approves the project, the next step is a site review before the Oak Bluffs planning board. The planning board can not reduce any conditions or requirements in an MVC decision, but can add or strengthen conditions. Planning board chairman Ewell Hopkins questioned whether the town hall project is receiving the same level of scrutiny as similar private projects. The planning board has 60 days to complete a site review. The clock stops on the 60-day requirement while the MVC conducts its review. In a 2016 survey, former town building inspector Mark Barbadoro found the town hall was in dire need of repair or replacement — far more than any other town property. The survey documented rotting window casings, failing heating and air conditioning systems, asbestos building materials and dangerous exposed wiring. The building does not comply with fire codes, or federal laws governing access for people with disabilities. The new town hall is designed for a total of 20,960 gross square feet, an increase of 64 per cent over the space in the current building. The three-story building with a partially finished basement will be a little longer and narrower than the present building. It would be set back further from School street, but a bit closer to Pacific avenue. Plans show the main level with access from Pacific avenue would include the offices for the departments of accounting, assessing, tax office and tax collector, treasurer, and a multipurpose meeting room with a capacity of 60 seats. The lower level will house the offices of town clerk, building and planning, board of health, conservation commission, a shared meeting room, and storage. The upper level of the new building includes offices for the town administrator and assistant town administrator, selectmen, planning board and a large conference room. Before construction of a new town hall can begin, town officials and staff will move to temporary headquarters on town owned land behind the Catholic Annex, which is across from town hall on School Street. The town plans to house staff three double wide trailers during what is expected to be two years of construction. Please ban the construction team who built the new public building from bidding. Lowest cost bidder gave us lowest quality building. We deserve better.